As the severe winter cold begins to recede we are left facing a spring where we will welcome our new daughter, currently going by the name Uncle Dee Dee, and also give the boys free reign of our backyard to destroy it in a way to match the inside of our house. In the cold months there has been a lot of play on the running piano. And there have been many demands to draw Spider-Man, their current obsession. 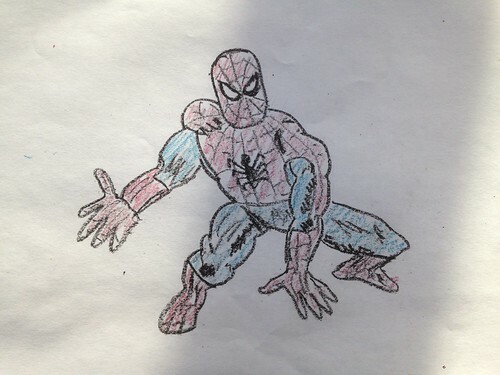 Above is an example of the Spider-Man I drew while having both of them hanging on my arms and shouting demands. Normally Martin shouts directions at me which result in a giant ball with a Spider-Man head and stick arms and legs. He then demands that I draw Firestar and Iceman to occupy the exact same space and gets mad if I don't fulfill that impossible request. There have been a lot of clothes hanger fights while yelling quotes from "The Princess Bride." Also, I took to remodeling their horrendous closet to make it a little more user friendly. The resulting shelving from Ikea has made the closet much more useful. The downside is that it has become a jungle gym for the boys, making the already arduous task of dressing them in the morning into even more of a hellish nightmare. 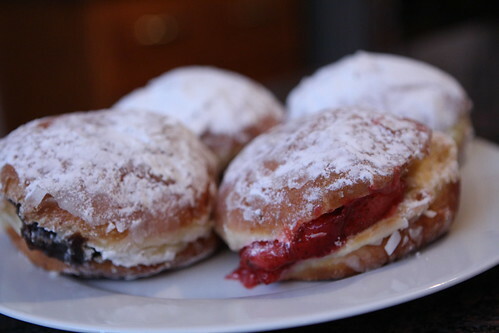 On Mardi Gras we had our traditional breakfast for dinner as well as some paczki, a local Polish pastry that may be the most delicious thing I've ever had in my life. Surprisingly they were only lukewarm about them. That was fine though because I was happy to eat all of their disgusting, drooled-on leftovers. We've taken to going out for lunch after swim class every Saturday. One Saturday we went to the Taco place and Elliott ended up in soaked pants as a result of PPP (Poor Penile Placement) in his diaper. This meant that I had to change him into a fresh diaper and we had to leave the restaurant with temperatures in the single digits with him wrapped in Auntie Lauren's shirt. Elliott was extremely annoyed because, as far as he was concerned, we had simply removed perfectly good pants from him and refused to let him wear them for no reason. Jen made sugar cookies with them on a day off and this resulted in a similar situation to the gingerbread house incident where it simply devolved into them just eating icing. With the temperatures still extremely cold we were also able to enjoy some dinner by the fire, a Bubs favorite. Jen got them some markers to draw on the windows which, of course, ended up with them drawing all over the walls. While they are washable it's not a trivial task to remove the marker from the walls. However, we were thankful that this new drawing area is far away enough from our couch that it did not get involved. Grandma has begun teaching them how to make forts which usually means I come home to all the chairs, blankets, sheets, and toys right in the center of the kitchen floor at least a few times a week. Nana and Grandpa came up for an extended two week trip which meant plenty of Storybots for everyone. 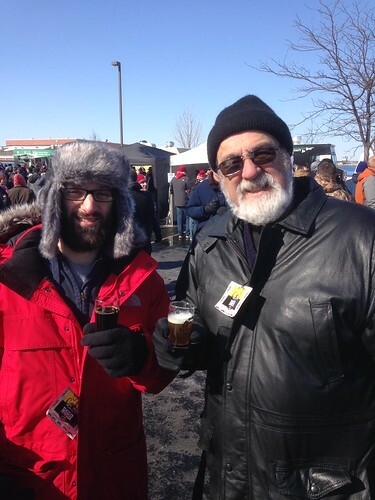 It also meant we were able to spend a toe-tingly cold day at the Naperville Winter Alefest. We got tickets a while back thinking it would be much less crowded than the summer alefest. That ended up being a grave miscalculation. Elliott took the opportunity to expound on how Grandpa has no hair on his head, something Grandpa undoubtedly appreciated. With the changing weather Elliott also got a chance to dress up like a Maine redneck. Grandpa was also able to draw on the window, following their distinct commands of drawing whales, mermaids, and skeletons. 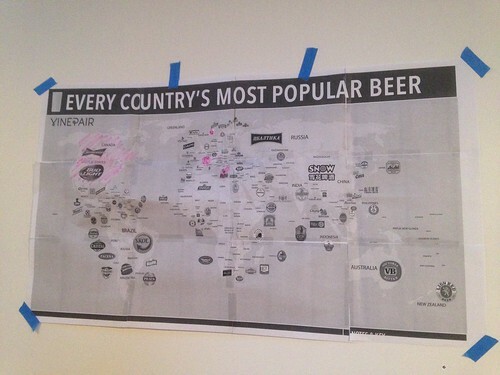 Uncle Doug came home from work last Friday with a giant map, ready to try the best-selling beers from each country. This is a fun game but sadly it means we're going to have to drink a lot of very crummy, mostly skunked European lagers in green bottles. But projects like this aren't about having fun, they're about winning. Once we have everything on the list, we win! Not sure how much luck we'll have getting our hands on some of the non alcoholic beers from the Middle East or the beer from North Korea, but it will be fun trying! 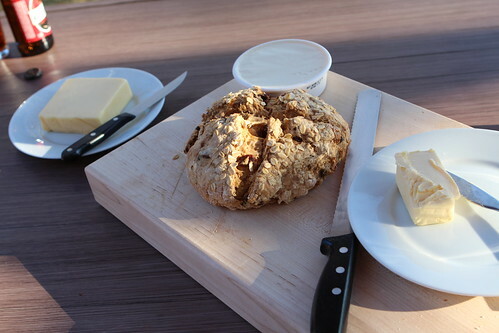 We had our St. Patrick's Day feast the following day and it was so warm we enjoyed our soda bread, cheese, and butter outside on the deck! This sure beatthe year we lost power in the bitter cold. 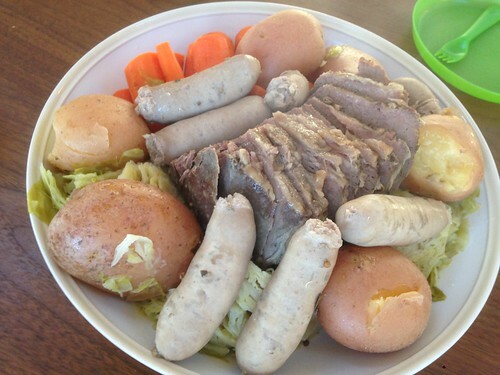 The dinner came out great with the traditional bangers boiled together with the corned beer despite Jen's mother's extreme hatred of corned beef. We went to a friend's birthday party on Sunday where the cake was a huge hit. The only problem is that cakes with extreme-colored frosting on them should come with a warning about what your child's poop is going to look like the following morning. So as not to alarm forgetful parents. Martin's new thing is freaking out in the morning and demanding specifically shaped pancakes. Sometimes he wants polar bears. Sometimes he wants random letters. Here's a picture of me giving in and just cutting his round pancakes into S-shaped pancakes. This is a phase I wouldn't mind seeing end immediately. All the while Uncle Dee Dee is doing great. It's much different than Jen's previous pregnancy where everyone was worried about everything and she was being tested all the time. Now, while tired of the persistent acid reflux, there's been very little testing or cause for concern. In fact, we're so busy with the boys that even she forgets she's pregnant most of the time. This is a huge difference from last time where it was all we thought about or talked about. Last night Dee Dee seemed to be performing some sort of acrobatic routine in the womb. This was fun for me, less fun for Jen, and probably a blast for Dee Dee. Despite her acrobatics she looks so calm in this picture. It's like she's unaware of the frenetic madhouse she's about to born into. Soon enough she will be napping in the corner as Martin screams at me because his pancakes are not the right shape. I apologize in advance, Dee Dee.